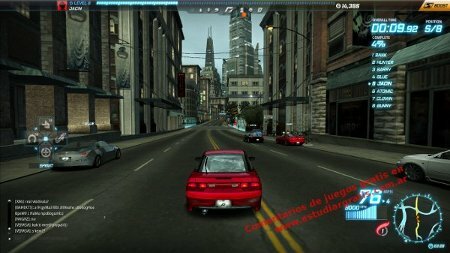 Esta lectura en español (This reading in Spanish): NFSW excelente juego de carreras online 3D. Free 3D racing game SuperTuxKart for all ages. 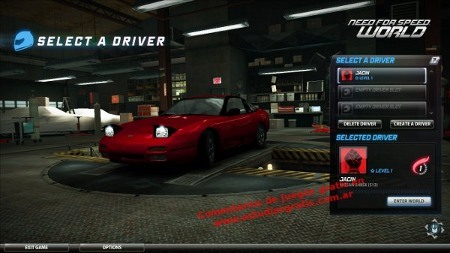 Need for Speed World Juego gratis online de autos con coches lujosos. Need for Speed World. Car racing game free online, with excellent graphics in 3D. I sum up: The game is cool for PC. It download an installer of a few MB after sign up in the Web of the designers. This game is free since years ago and it update. By using the installer, it will download the game, which is a heavy download (Within some opportunity it has delayed about 10 min in starting to download). Need for Speed World, has all the colorfulness from the ultimate ones NFS, in spite of this it worked me in a notebook with integrated graphic card ATI 4250, into a selected quality of medium level. It's an online game, where it's driving with a car in a vast world, it going up level, improving the vehicle, unlocking many more parts of virtual world; even there is skills! When advancing is unlocked roads, places and cars -great collection of free games in Estudiargratis.net-. It's played for free, but there are options to adding some stuff, purchased it with real money, thus, the user will have more special cars. No just there are car racing, also there are chat, and persecutions from cops; for example if you crash with a police car, this one will pursue you, around various states; if the police catch you, you will have a fine. To be honest this game I liked a lot. Another one more recommended for the collection of legal games for free, without virus or malware, tested. Need for Speed World screenshot game. Did you know that free downloadable games are controlled from time to time, and you have a legal collection of games?